This beach ranks #5 of the "Best beaches in Jeju island"
A little to the north of Gwangchigi beach, there are many budget guesthouses with rooms' rates starting from US$40 per night. Fly to Jeju international airport (CJU). Next get by bus number 701, 710 or 910. The best time for a beach holiday in Gwangchigi is a warm period from July to September. 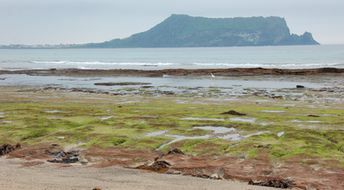 Try to google for: jeju island tides. As I understand, next week, low tide will be in the afternoon. may i know the low tide hours for this beach for next week?